My dad has almost never stayed for more than a night or two, and rarely comes to visit on his own. My stepmom Robie still works, so their visits are brief. She grew up here, so she has her own list of VIPs to see on their long weekends. We normally get them as a matched set, for 24 – 48 hours. I was shocked when Dad accepted my invite to come for the week while Robie was gone in Italy! My delight turned to dread as the visit approached. We live in half the square footage they do, and our home is extremely modest by comparison. While we don’t aim to impress, we do clean house and make beds and dinners for their visits. They arrive on Christmas mornings just in time for coffee, quiche and mirth. The tableau they find includes a blissful grandson in matching PJ top and bottom, sitting in a nest of wrapping paper quietly playing. Mimosas are passed. The plate with cookie crumbs and half drunk milk rests on the hearth, just so. This is the closest we come to Rockwell. My dad has such a strong tendency to not want to intrude or be a burden, I sometimes mistake it for indifference. But he was game for the challenge and I invited him in. He learned the way to Robin’s school and picked him up at 3 for the week. They bonded over Popsicles and a shared appreciation of Odd Squad. He heard about our work days and helped us forage the fridge for nightly meals. And more than anything, he understood. Understood our daily grind and exhaustion. Our willingness to let bad behavior pass sometimes out of sheer weariness. Even the mysteriously long time it takes us to deposit checks he sends for birthday gifts. We’re just swamped. We hit the skids one night in the middle of his stay. Our family meltdown was something about Robin’s bad behavior, Randy’s slack response, my nagging him about parenting and then a reverse domino that sent the vitriol back around again. Lots of tears and yelling and guilt. Having my father as a witness only intensified my shame. My dad was unmoved, but in the good way. Like a rock. I cried. I talked. He listened. Without judgement. This to a man who read me The Velveteen Rabbit regularly in childhood. This is Real. At the end of a long workday, we look nothing like our Christmas card photo. Dad and I laugh about it now. It was a pivotal night in our relationship. Sausage Factory has become code for human, vulnerable, honest. I feel brave for letting him in. And I think, strangely, we both feel lucky. On a date night at the end of the week I found myself relating a version of the meltdown story to some friends at a cocktail party. I blushed as another guy agreed he had understood the same thing. 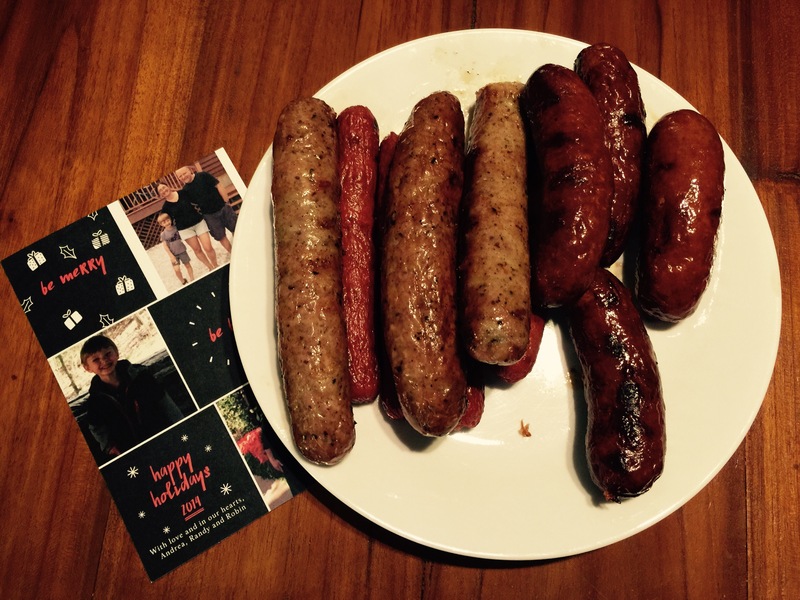 “I pity my wife,” our host told me, “because she lives in a sausage factory” (with him and their three sons). When I told my father about the confusion he was quick to dismiss these guys. The allusion to the famous quote about government was over their heads, he said. When I said the words aloud we fell into fits of laughter. We howled until we cried about misunderstandings, sausage, and our sausage factory. Our dear, dear sausage factory. I’ll fly the freak flag proudly on his next visit. 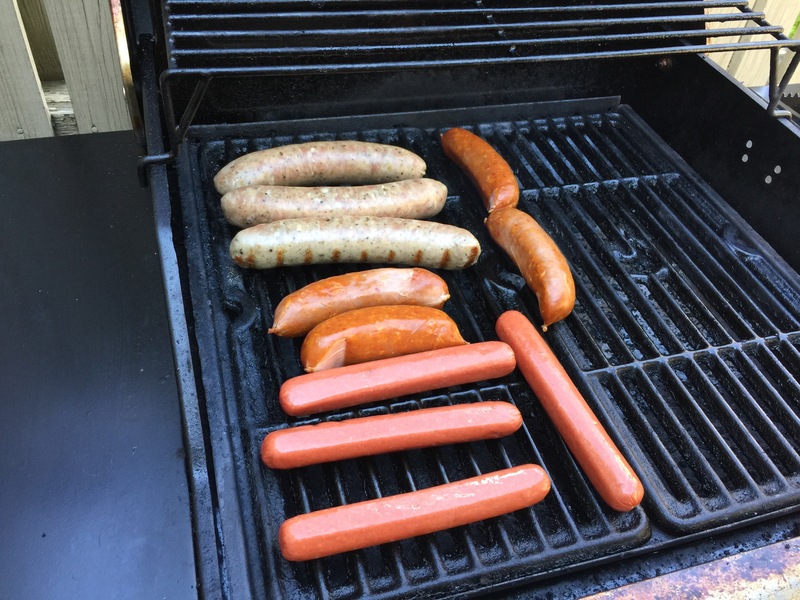 This entry was posted in Family and tagged father daughter, grandfather, house guests, kids, meltdown, parents, perenting, sausage, sausage factory on August 2, 2015 by aszyper.